The Central Montana Regional Authority (CMRWA) was officially organized in September 2004, but it was actually a project that was conceived four years prior. Central Montana Resource Conservation and Development (RC&D) Coordinator Monty Sealey recalls that the effort was originally called the Musselshell Valley Regional Water Project and he began working on this quest for water in early 2001. Roundup was in desperate need of good water and so are the other communities along the proposed waterline route. The drought cycle of recent years hasn't helped the situation some communities have literally been running out of any water, let alone good water. City councils were contacted to gauge interest in late 2000 and early 2001, and Judith Gap, Harlowton, Ryegate, Lavina, Roundup and Melstone all voiced their support of a regional concept. Since there was no doubt about the need, the next step was to see if such a regional project was feasible. The Montana Coal Board funded the group’s request to drill a test well to prove a water source, as well as quality and quantity. The group looked at several sites for a test well, but negotiations with landowners didn’t prove to be fruitful. After more than a year of seeking out a site for the test well the group finally settled on State Lands acreage across the highway from Utica, right next to power. The group hired Morrison-Maierle, Inc., engineering firm to oversee the drilling project in spring 2003. There are many unknowns about the geological layers beneath the topsoil, but geologists’ “best guess” was that the Madison Aquifer was about 2,500 feet below the surface. Unfortunately, that educated guess was off a bit—and drillers found the Madison at 3,700 feet. The extra depth took a huge chunk out of the feasibility budget, and the group went to the Montana Department of Natural Resources and Conservation (DNRC) with a request for help. The Montana Legislature approved an appropriation for the project in the DNRC budget for two years, and the project was back on track. While the group was seeking funding to finish the job, they also formally organized in September 2004 under the banner of Central Montana Regional Water Authority. A board of directors represents each community to be served by the regional system. Great West Engineering was awarded the bid in the summer of 2005 as the firm to complete the water testing and design of the project. Public meetings were held during this process in order to disseminate information. DNRC Water Rights office in Lewistown received only one formal objection to the CMRWA water right application for the Utica well by the comment deadline Sept. 15, 2006, and that was from Montana Fish, Wildlife and Parks (FWP).FWP has water rights at the Big Springs site and on the Judith River and wanted to insure no adverse affects. CMRWA and FWP signed a Memorandum of Understanding in Fall 2006. CMRWA agreed to conduct a spring inventory report of area spring complexes before the water line delivers water to customers. 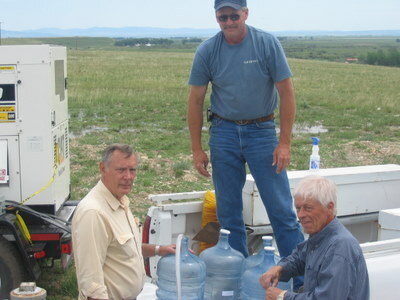 CMRWA received a water right for 300 gallons per minute on the Utica Well in June 2007. CMRWA has been funded in large part by DNRC appropriations approved by the Montana Legislature. In both the 2007-2008 biennium and 2009-2010, the group received $298,000. They also received a $300,000 DNRC Reclamation and Development grant for a second production well. However, they have been unsuccessful in securing matching funds to proceed from the federal level. CMRWA will seek funding to finish the feasibility study through the Bureau of Reclamation under the Rural Water Supply Act of 2006.